Order up some campy Japanese style with this fresh and fun sushi cup. 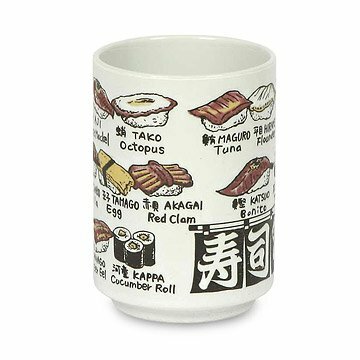 Featuring colorful illustrations of sushi rolls and sashimi pieces (labeled in both English and Japanese), this white ceramic mug is designed in traditional Japanese style (no handle) and its playful motif adds takeout fun to any beverage. Made in Japan. Very nice textured artwork. Great peice for anyone who likes the Japanese style. Adds nicely to your table presentation. Fair price for the detailing on this product. Just an adorable and very unique little cup! My 12 year old uses it for tea....she looks very fancy using it! Bought this as a gift for my sushi-loving/coffee loving father in law. I thought it had a handle like a coffee mug, but it doesn't! It's still very beautiful and can serve as a learning tool for ordering sushi! Very cute little mug. The outside does get hot but cools quickly without letting the contents get too cool. I use it with my little teapot for my nightly cups of tea. Great size and seems very sturdy. Wonderful for my sushi-loving buddy! my fresh-tuna-seeking buddy loved the cup! this was a gift and they loves it! Another perfect gift for the hard-to-buy sushi lover!